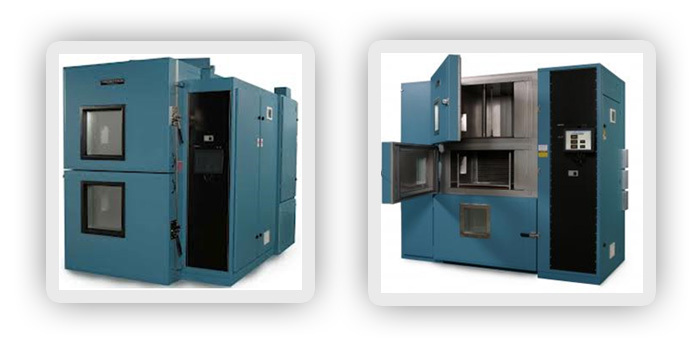 THERMOTRON offers several configurations of thermal shock chambers capable of meeting a wide variety of testing needs in accordance with reliability programs, quality control programs, and other commercial test programs; as well as military tests MIL-STD 202, 883, and 810 and JEDEC. Cold Zone in Thermal Shock Chambers can be used as an independent Temperature cycling chamber, resulting in better return on investments. Standard models are available in 1.0 cubic feet (28 Liters), 3.2 cubic feet (91 Liters), and 9.0 cubic feet (255 Liters) basket size, with different mechanical compressor size for accommodating various specimen loads for faster recovery times and complying with various international standards. Additional LN2 & CO2 boost cooling is available to achieve faster recovery times. 12″ color touch screen display Controller is powerful interface, allows easy programming, tracking and display basket location. It has Built-in system status, monitor, and alarm functions and product temperature control features and these features make Thermotron Thermal Shock chambers one of the sought out equipment in the market. Thermotron continues to learn from the market place and implement new technologies that enables easy use of the equipment, power saving and most importantly keeps itself abreast with customer needs. Horizontal Orientation– Three-zone thermal shock chamber – Hot, Ambient and Cold Temperature Zone. Double Duty Vertical– hot zones above and below the cold zone and a two compartment product carrier that simultaneously moves products between the hot and cold zones.